There's something really, really seductive about looking at a trail map. The mind wanders from stream to lake, looking for great places to fish. The climbs all seem steep, but pefectly doable on the kitchen table. Eight miles? Ten miles? Twelve miles, but most of it downhill? It all seems so easy. The views from the passes are always amazing, and the campsites are always nicely isolated. We've just spent a few hours planning our summer adventures, and from the maps we've seen, they should be perfect trips. Of course, our packs always seem lighter before we put them on at the trailhead! We have plans to explore the northern reaches of Yosemite this year, going where few people go, and seeing parts of that park that are reputed to be both isolated and magnificent. 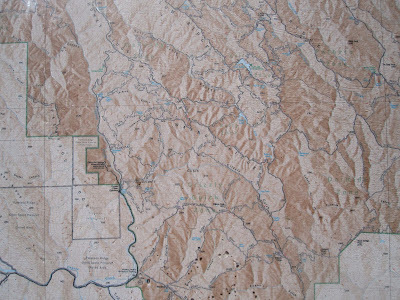 And we're also planning to re-trace a trip I took 35 years ago, up into the Cloud Canyon of Kings Canyon NP...with a hope of seeing some Golden Trout and the Whaleback again. Add in a few shorter trips, one in Desolation Wilderness for a weekend, and another exploring the Wire Lakes in Emigrant Wilderness, and we've got a lot of fun in store.